The skin care products you use for your baby should not be the same products you use on your skin. Since baby skin is much thinner than adult skin, it is more sensitive and susceptible to irritations and other skin problems. Use baby skin care products specially formulated for baby’s delicate skin. How to choose a mild baby lotion? Humectants hydrate the skin by pulling in moisture to the outer layer of the skin. Examples of humectants are hyaluronic acid, glycerin, and panthenol. Emollients are responsible for making skin smooth and soft by sealing the breaches between the cells. Examples of emollients are jojoba oil, glyceryl stearate, and silicones. Occlusive ingredients. Occlusive ingredients including mineral oil, waxes, and lanolin lock in moisture. Skin repairing ingredients such as cholesterol and ceramides. Mild baby lotion does not contain dyes, fragrances, or other artificial ingredients. However, some baby lotions have fragrances caused by the mixture of organic ingredients. Among the hundreds of baby lotions in the stores today, identifying mild and gentle ones is challenging. So, which among them is really safe on baby’s sensitive skin? Introducing, Aveeno Baby Daily Moisture Lotion, specifically formulated for baby’s delicate skin. Aveeno Baby Daily Moisture Lotion provides moisture for up to 24 hours. It is a special formulation of 1.2% dimethicone, water, petrolatum, cetyl alcohol, sodium chloride, and other ingredients. It contains colloidal oatmeal that acts as a skin protectant against dry skin and maintains the normal level of the skin’s pH. Oatmeal is recommended by many pediatricians because it is safe for sensitive skin by absorbing moisture and healing swollen skin. It does not contain dehydrating alcohol and fragrances that block pores. It is hypoallergenic, mild, and fragrance free. It is safe for daily use on baby’s sensitive skin. Aveeno is long known to formulate skin care products through scientific advances. Aveeno Baby Daily Moisture Lotion is non-greasy and leaves skin moisturized for 24 hours. If your pediatrician recommends you to moisturize your baby’s skin, make sure that you apply baby lotion that is specially formulated for delicate skin. It should contain only mild ingredients that won’t harm the skin. Ingredients of mild baby lotion are humectants such as hyaluronic acid and panthenol, emollients such as glyceryl stearate and jojoba oil, occlusive ingredients such as mineral oil and waxes, and other ingredients that heal the skin. Mild baby lotions do not contain fragrances, parabens, or dyes. Aveeno Baby Daily Moisture Lotion is a special formulation of colloidal oatmeal, dimethicone, and other ingredients. It is mild and safe on baby’s delicate skin because it is hypoallergenic and does not block pores. The colloidal oatmeal acts as a natural ingredient to soothe, heal, and guard skin against dryness and other skin irritants. There are other baby lotions that can be compared to Aveeno Baby Daily Moisture Lotion. Eucerin Baby Body Lotion is recommended by pediatricians and dermatologists to be used for babies on a daily basis. 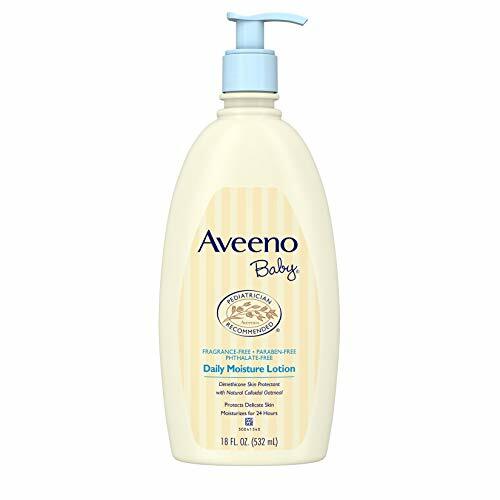 Just like Aveeno Baby Daily Moisture Lotion, it is hypoallergenic and contains natural ingredients that aid in moisturizing and protecting baby’s skin. Eucerin Baby Body Lotion has a unique pro vitamin B5 that aids in hydrating and nurturing skin. It has natural shea butter that smoothens and softens baby’s skin. It could be a good alternative to Aveeno Baby Daily Moisture Lotion but it is more expensive. Aveeno Baby Daily Moisture Lotion and Eucerin Baby Body Lotion are both safe for daily use and contain natural ingredients that help smooth, moisturize, nourish, and guard skin against dryness. Each of them has different ingredients and formulations derived from nature. They are both recommended by pediatricians and dermatologists. Aveeno Baby Daily Moisture Lotion still stands out because it is more affordable compared to other brands. Plus, Aveeno is known to formulate mild skin care products through scientific advances. No wonder many users and parents feel safe even when they use it on a daily basis. It is hypoallergenic and leaves skin smooth and soft. Baby’s skin absorbs Aveeno Baby Daily Moisture Lotion fast and it is non-greasy on skin. It has a pleasant smell that is not irritating and provides moisture for up to 24 hours. The only thing that one user found odd is the dispenser which could have also been available on other Aveeno products such as baby liquid shower bath and shampoo.